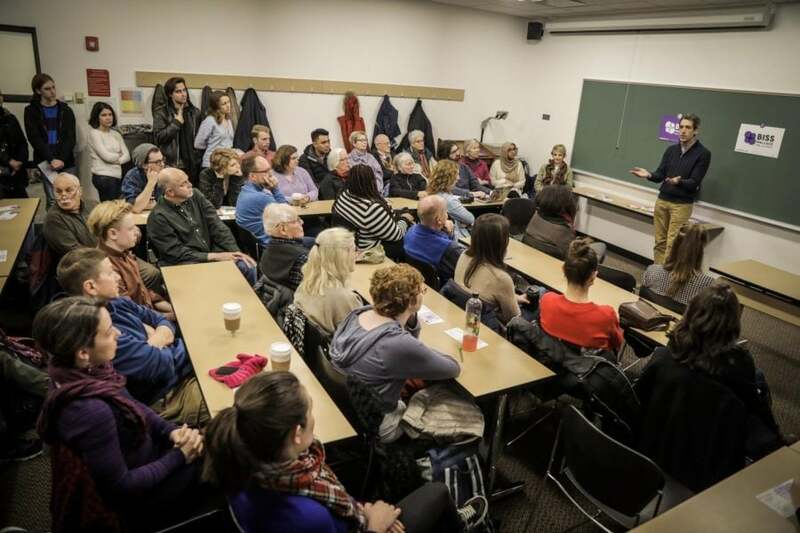 Democratic candidate for governor Daniel Biss held a town hall-style event on Saturday, Feb. 3, where he discussed his positions on campaign finance reform, reproductive health and the niceties of negotiating a state budget. 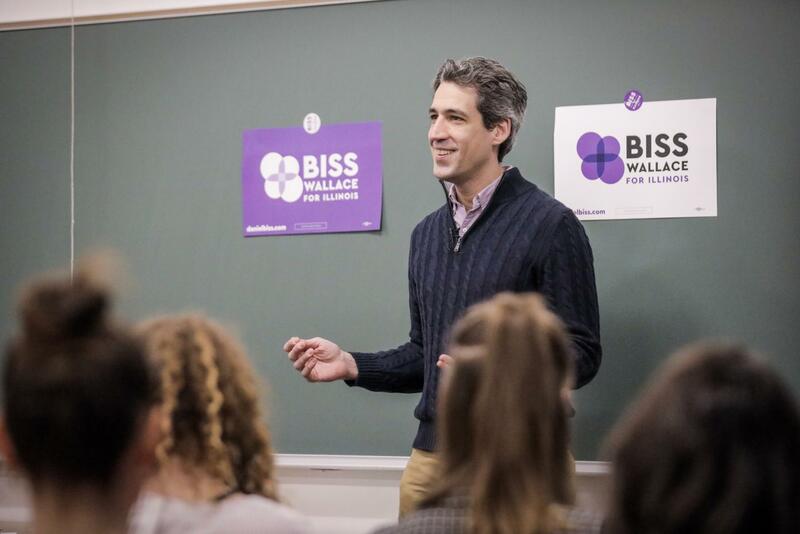 Biss seemed at home back in a classroom on the fourth floor of the Levan Center in front of a chalkboard, a place he had spent a great deal of time as a mathematics professor at the University of Chicago. Biss cosponsored a bill in the Illinois General Assembly that would legalize recreational marijuana, but said that he would commute the sentences of those convicted of marijuana crimes. He addressed ways to curb Illinois’ declining population. “I will not build a wall,” he said. He said that the Illinois population crisis has punished higher education institutions in the state. “I tell people that Bruce Rauner has been a horrible governor for the state of Illinois, but one of the best governors the University of Wisconsin has ever had,” Biss said. He pointed to the sharp decline in population during the budget crisis, where Illinois went two years and six days without an operating budget because of political gridlock in Springfield. Biss stressed that a functioning budget must be maintained at all times if the state wants to retain jobs and taxpayers. Biss stressed his view that the political problems of the state did not begin with Rauner’s election, but have been simmering below the surface for decades because of a faulty corporate and personal tax system. Biss then got into a discussion about reforming campaign finance laws, something that has become a point of contention in this election. Incumbent governor Bruce Rauner is the billionaire former chairman of a venture capitalist firm and the Democratic frontrunner J.B. Pritzker is another billionaire who has written his campaign almost $50 million. “This race is a referendum on money in politics,” Biss said. He remembered sitting in his campaign office on a Friday afternoon early in the race when he first heard that Pritzker had written himself the first of an eventual seven $7 million checks. “Well, goodbye,” he said he thought at the time. He thought his campaign was over because he would never be able to match the funding of his wealthy opponent. He said he came into the office after a depressing weekend on Monday and posted a picture to Facebook of a $25 check he wrote to his campaign and suddenly, small contributions started coming in from all around the state. Pritzker has most recently used those lofty checks to start running attack ads against Biss. But he’s not concerned – in fact, he’s glad. “I have been, this past week, the beneficiary of one of the greatest compliments in American politics – they’re running attack ads against me,” Biss said. He expressed his support for a campaign finance system like New York has implemented, where the state matches political contributions made by regular citizens. He recognized that some people would have qualms about allowing the government to get involved in the financing of political campaigns, but offered an alternative way of thinking about it. “Taxpayers pay for voting machines,” he said. “We use state funds to mail absentee ballots to voters overseas. We pay for election judges to ensure that we have fair and free elections. Sandy Gartler, a long-time Lincoln Park resident, said she thinks Biss has the best shot of any of the Democratic candidates to unseat Rauner. Sandy brought her sister Barbara, who lives in Madison, Wisconsin. Barbara said she wished they could have a governor like Biss in her state, where Republican Scott Walker is in the governor’s mansion. Just a quick fact check: Rauner isn’t a billionaire.